Jewelry Depot, Inc. is a wholesale jewelry company that has been selling contemporary metals, mainly Tungsten Carbide, Titanium, Cobalt Chrome & Ceramic jewelry for over 10 years. We are located in downtown Los Angeles, in the heart of the Jewelry District on 7th & Hill Sts. Our website, catalog, special offer, availability list, and order forms are wholesale. We look forward to being of service to you! 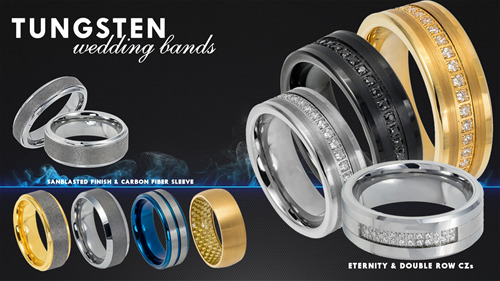 Sanblasted, Carbon Fiber & CZ Inlayed Tungsten Rings, Titanium, Ceramic & Cobalt Rings!